Today we're going to cover how to make fur cloaks and pelts. We're actually going to look at how you can sculpt some fur, mold it and then be able to use casts of that mold repeatedly. No more trying to sculpt the fur directly on the figure. This is not a new trick, there's a tool already out there that does this very thing. Micro Art Studios makes a rubber mold you can buy. I remember seeing one of these a long time ago and thought it was an excellent idea for making fur. Combine that idea with my use of BluStuff, I figured I could make my own. I'll say that the model here is a test model. He's got some mistakes and I could have done it better. The real trick was seeing if it could be done in the first place. And it most certainly can. The first thing we need to do is sculpt the fur. This is easy enough to do. I did this on top of a piece of plasticard. Make sure to leave enough room around the edges so you can make your mold using BluStuff once you're done. 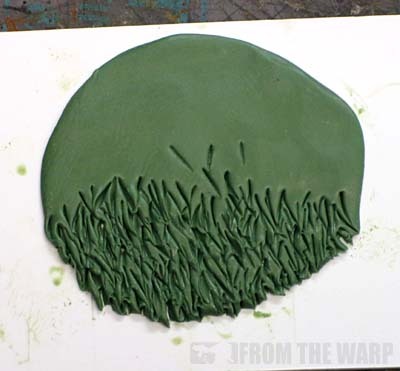 I sculpted my fur by spreading out my greenstuff (50/50mix) into a area making sure I had the same thickness all the way across. This test piece is small and if I were to do it again, I'd make it much bigger so I could cut any kind of shape out of my casts later on. This small size limits me to small sized pelts. I used the regular GW sculpting tool for this too. Working from the bottom up, I repeatedly make small indentations into the greenstuff at a slight angle. A few to the left, a few to the right and so on and so on... Keep repeating the angled strokes all the way up the layer of greenstuff. Sometimes I'll twist the tool slightly as I press it into the greenstuff to give the fur a slight curve and not all the strands look straight. Here's the finished piece of fur compared to a model. You can decide to make your fur strands long or short, straight or wavy and so on. Once you've got it sculpted, leave it to cure overnight. Now we make it super easy to make lots of fur pelts from here on out. 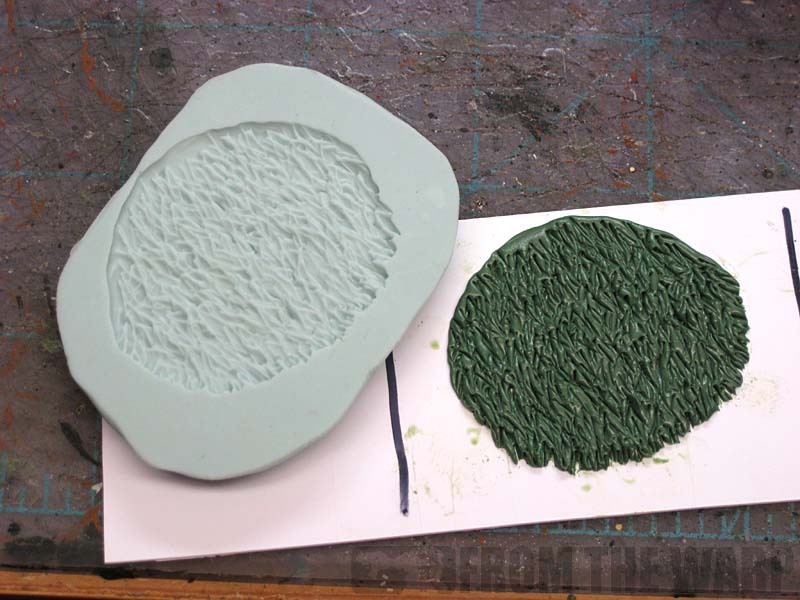 Using BluStuff, make a simple, one-piece press mold of your fur. You want your mold slightly thick and flat on the top (the side facing up and away from the fur). You want the top flat so that you can flip it over when done and it will lie flat on your desk without any issues. Give the BluStuff plenty of time to cure (it doesn't take long actually) and you're all set to start making casts of your fur. To make a cast, it's as simple as mixing up your greenstuff, pressing it into the mold making sure it gets into all the tiny fur strands and leaving it for about 45 minutes. I used a 50/50 mix again for my test. In this one though I only waited about a half hour and I wish I'd given it a few more minutes to harden so I didn't lose my detail so much when I removed it from the mold. Lesson learned. 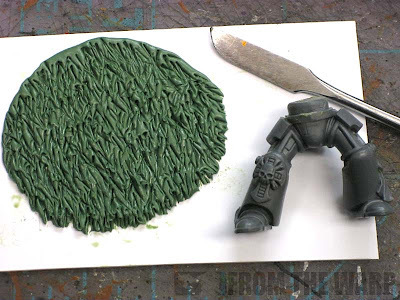 Remove your greenstuff from your mold carefully and set it down on a piece of plasticard. Make sure the plasticard is lubricated with something so your greenstuff doesn't stick to it! Take your X-Acto knife and cut out the shape of the fur you want. Very similar to making a cloak like we did in the previous post. Take your cut out piece of fur, place it on your model and set it in position. When you're cutting your fur pelt out, you'll have a top edge and a bottom edge. The top is generally a smooth line and the bottom will be a bit rougher or varied. The picture above shows you what I mean. The shape is different, but the idea is important. The fur you sculpted hangs in one direction. You have a top and a bottom. The top is where the fur "starts" and the bottom is where it "ends." In this picture, I cut out what would be an animal arm. I could attach this to the body portion of my pelt by hanging this over the model where i wanted it. I would need to clean up the red line areas, blending the blue line are with the other portion of the pelt and then make sure the purple lined area has enough variety and a rough edge to simulate the fur strands hanging down. For this model, since I have a small mold, I only cut out a small crescent shape pelt. The inside clean edge was to be the top (around his head) and the outside rough edge was to be the bottom (the part hanging over his shoulders). 1. Clean up the leading edge. You can do this by pressing your tool into the leading edge to remove the cut line and make it look like the fur comes all the way over the edge. Very easy to do. 2. Create additional texture. 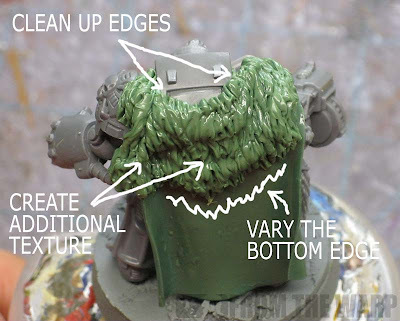 Just like the cloak, the greenstuff pelt will fall into place and develop some minor folds in the process. You can use your tool to exaggerate those folds and add additional recessed areas until you have the look you want. 3. Vary the bottom edge. You want to have some variety as natural fur would have. Anything to smooth or clean here and it won't look right. This is only the beginning. You could take multiple pelts and piece them together for a bigger one. You could cut out different fur shapes like a leg and such to drape over shoulders. 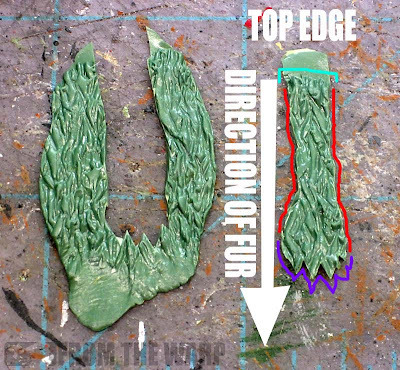 You could even layer the pelts to build up some depth and really bulk up a model. I'm sure if one pelt is good for a Space Wolf, two must be better. Interesting. I don't have Space Wolves, but I know a few D&D models this would would well on. Thanks! 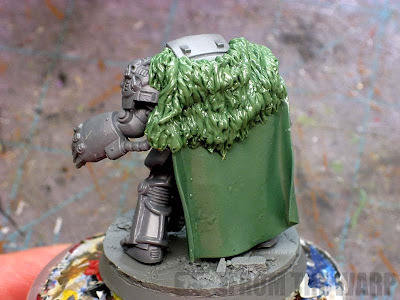 Between this, the cloak tutorial from earlier in the week, and the guest post about snow basing from way-back, I am set to tackle some Space Wolves! I always learn something new (sometimes several somethings) from your posts. Hopefully I won't get too carried away and end up with an army of walking pelts with guns. it might be of use. What would you use to lubricate the plasticard? Fayte: I'm sure this would across most ranges of games. Ashley: There you go, you're all set now. It's like weathering though... add enough pelts until you think to yourself "I just need one more," and then stop right there. 40K Giveaway: They're easier than you think. Green Stuff Industries: Space Wolves my friend. I built the model just so I could do it here. I just need to paint him now. Karitas: a very good point. For folks who aren't comfortable with trying to sculpt fur directly onto a model... this might help get them started. Even waiting 45 minutes, you still have some work time with the greenstuff and you can work the details. I've got a followup to this post that might improve the process, but I need to work out the kinks first. Cornu Mortem: I use cooking (vegetable oil) spray. I don't have to worry about any toxicity issues and it gives me a light coat of oil I can work with. Repeat as needed. Once your greenstuff cures, you can wash off the bit with warm soap and water. Ron, I'm wondering would the same skill set be used in trying a dinosaur skin be the same? Asking because thinking of trying to make a pelt for my fleshtearer captain, fluff zays their homeworld has large Trex type carnivor on it. EllisW: Absolutely! I don't see why it wouldn't work for that kind of pattern just as well. This is such a cool tutorial. Thanks Ron! An awesome and very welcomed tutorial. Will definitely be using this to enhance my sculpting skills. Thanks for sharing! Gonewild and Kevin: Excellent, glad it helps guys! Great tutorial Ron , if I ever get around to getting my hands on a lysander model to convert into a belial of the dark angels, I'll be using this tutorial to make a lion pelt :-). Ginger Kid: Thanks! There's a part I did not add to this tutorial... the addition of animal heads still attached to the pelt. If you need to for your lion, you could grab a bit from elsewhere and incorporate it into your pelt. Otherwise, you should be all set as is. Good luck with with your Belial conversion, I'm always glad to see folks model him more appropriately. You can call me Andy: Very true. And that's not being lazy. If it works for you, it's perfectly acceptable.